Enter to win a KitchenAid Stand Mixer! 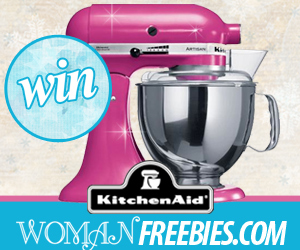 WomanFreebies.com is giving away a KitchenAid Stand Mixer on their Facebook Page now!! Prize Description: The KitchenAid Artisan Series comes in 25 awesome colors and has tons of attachments so you can use it to make homemade pasta, stuff fresh sausages, whip up ice cream, and give fruit a squeeze. No wonder generations of cooks have cherished theirs!